Those of us who use these river crossings every day tend to take them for granted and you can amaze yourself by trying to plan a journey from, say, Shepperton to Walton, imagining that Walton Bridge had suddenly ceased to exist. Believe me, it’s a real eye-opener! Perhaps it was the inconvenience of just such long detours that prompted Samuel Dicker, a local Surrey landowner who also operated plantations in Jamaica, to decide to fund the construction of the first bridge over the Thames at Walton in the middle of the 16th century. Dicker obtained the right to build the bridge through an Act of Parliament in 1747 bu he also secured the right to collect tolls from those who crossed it. Previously, the only way to cross the river at this point was to use a ferry and, unsurprisingly, the ferry operators were not terribly thrilled at the prospect of losing all their trade. Also voicing objections to the plan were bargemen, who argued a bridge would present a hazard to navigation, and some of the good people of Walton who claimed the construction of a bridge linking the Middlesex and Surrey banks would bring into the town what they described as ‘undesirable types from the north of the river’ (It’s not clear whether folk who lived in Shepperton and Lower Sunbury felt the same concerns in reverse!). 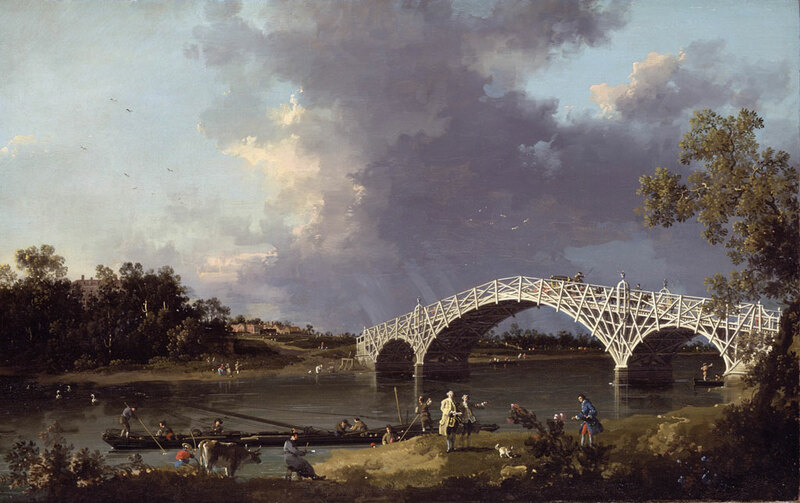 The first bridge – a wooden lattice structure – opened in 1750 and it was made famous by artist Giovanni Canaletto, who painted it in 1754. Tolls for crossing it ranged from a halfpenny for pedestrians up to two shillings for a horse and carriage. The timber bridge lasted until 1783, when it was replaced by an arched brick structure that was opened in 1788 and stod until 1859, when it collapsed because the central support on the river bed sank. Fortunately nobody was hurt.